The Smokehouse on Braunstone Gate was one of the city’s stand out restaurant successes of recent years. At the time of its closure there were some rumours of a possible reappearance in Loughborough. Well it’s taken a while, but it turns out there was substance to the gossip and so a big welcome to Fenway’s. It’s part of the Orange Tree group, which already has the Orange Tree and the Kelso in the town, and while there are some obvious differences to The Smokehouse, the good news is that the head chef Liam Watson is back in charge and that the menu features some of the dishes that made the Smokehouse special. Crucially, it takes no shortcuts to those big smokey, barbecue flavours that characterise the food of the American South. Located in a large pub building, they’ve given it an extensive refurbishment that thankfully doesn’t go overboard on the American diner theme. Nonetheless Fenway’s is a different proposition to the rather intimate, bistro style of its predecessor. It’s big, informal, a bit noisy with a bar area at the back. Open all day from 12, it’s family-friendly, student- friendly, the staff are young and funky and there are craft beer and cocktails – it’s good fun. We started off with excellent cocktails – one of their originals featuring locally-made Burleigh’s gin with cointreau, passionfuit and ginger beer, and a sophisticated adult milkshake with Jamaican rums, vanilla and chocolate ice-cream, ginger cake and milk. Food starters included an absolutely stonking dish of smoked ox cheek. Smoked meats here are marinated overnight and smoked for at least 8 hours and the time given to it really shows. I went at the nuggets of beef with a knife and fork but the knife wasn’t necessary – it fell apart with a fork and had great depth and complexity of flavour. It was nuthin’fancy – served up in a pork-fat yorkshire pudding with gravy and nicely sharp house pickles – but it was proper cared-for food. Bourbon and orange cured salmon was a fruity delight too, allowing the flavour of the fish to come through, and with sourdough toast and plenty of green leaves it was still a substantial dish. Jalapeno and smoked onion hush puppies – fritters made with cornmeal batter – were light, crisp, tasty and the significant but sensible chilli heat was spoked with thyme and garlic sour cream. My guests had admitted they probably wouldn’t have come in from the look of the place, but were by now really pleased they had come along. If the starters were substantial, the mains fully merited the “come hungry, we don’t mess about” warning on the menu. The core of the selection is burgers (28 day aged beef) and a variety of smoked meats – brisket, pulled pork, St Louis cut ribs and so on. From the burger menu we had the buttermilk fried chicken breast – moist, tasty and well-served by its dressing of avocado, pickles and sweetcorn and pepper relish. The sweet potato fries failed to impress – I tend to avoid them as the moisture content makes them hard to crisp but my friend who generally is a fan found these a bit flabby. I picked the house sausage bun, which came with lashings of the juicy, 14-hour smoked pulled pork. The sausage was a very long way from your traditional banger – more like the traditional Louisiana boudin, it was coarse-textured with a strong tang of offal. This maybe won’t be to everyone’s taste but well done to the chefs for not taking the easy way. Both these came in a manchet bun, a traditional English bread that the menu claims to be better than brioche – and in this context I’d concur. Firmer and not so sweet, it’s an excellent burger bun. One more main was 12 hour smoked brisket – copious amounts of beef dripping with a spiced gravy, piles of smooth mash and nicely spiked red cabbage. We may have been stuffed but in the interests of reviewing we had to try deserts. Salted caramel sticky toffee pudding had been a highlight of The Smokehouse menu and reappears still in very good form – sprinkled with pecans and a touch of popping candy. My guests immediately made plans to bring their 10 year old daughter, a connoisseur of the desert. Key lime pie – sometimes a virulent green cliché – brought a big smile of delight. It was lightly bruléed and gave a great balance of sharp and sweet with a fine dark pastry case. I was relieved to find that expanding the Smokehouse concept to a bigger and brasher format has been been done without sacrificing too much flair and quality. You’ll need to buy into the concept – it’s not for faint hearts or those who want pretty pictures on a plate – but if you do there’s much to enjoy. News round up – KRIII, Knight and Garter, Oscar and Rosie’s, Fenway’s. I know I don’t update this blog frequently enough for it to be an important source of news, but every now and again I feel the need for a round-up of stuff and today is one of those times. First off, we’re getting very close now to the welcome opening of the King Richard III pub on Highcross Street, Leicester. The website is up, bookings are being taken from 11 April (though the first couple of nights are already full for food bookings it seems). I’m confident that head chef Chris Elliman, who has done such a good job with Crafty and St Martin’s café, will make this a great addition to the city scene. The menu looks a good combination of classic British roasts done on their Robata grill – a 1 kg dry-aged forerib of beef on the bone for two (£45) sounds a particular treat – and dishes with a little contemporary flair such as agro-dolce onion, sorrel and goat’s curd on sourdough toast (£5.50) and below, crispy spiced lamb roll, pickled red cabbage, yoghurt, green chilli and mint. Also coming soon is the opening of what I think of as Plaza Claudio Ranieri – and it seems may actually be called Champions Square. This is the area that used to be the indoor market and will shortly be a public space. This development is giving a chance for the further expansion of developments around St Martin’s Square. Already happening is the conversion of what was Molly O’Grady’s into the Knight and Garter – a joint development between Beautiful Pubs, Sam Hagger’s company that run the nearby Rutland and Derby and the Forge Inn in Glenfield, and brewers Everards. This is a lovely , grade II listed building and is set to open in Mid-May with an 82-cover restaurant and an impressive drinks selection with a terrace overlooking the new square. I imagine the food will be of the crowd-pleasing variety but likely to be done well. It may be tough to overcome City people’s preconceptions about this site but I reckon Beautiful Pubs are up to the task. Also brought in by the new square is Oscar and Rosie’s, a highly-rated independent pizza company founded by a Nottingham lawyer. I’ve never tried their Nottingham outlet but they seem to have a commitment to high quality ingredients. I’ve not got an opening date yet but it all sounds rather promising. Opening on 13 April in Loughborough is Fenway’s, the reincarnation of the much-missed Smokehouse from Braunstone Gate. Fenway’s on Baxtergate is the latest opening form the Orange Tree group and will also have Liam Watson from the Smokehouse heading up the Kitchen. The Leicester restaurant had a great indy feel about it – and indeed came about as a result of the Orange Tree bosses giving a creative young chef the chance to do his own thing. Fenway’s appears to have a more corporately-themed feel about it and a more generic smokehouse menu, so I hope there’s still the opportunities for the chefs to play and experiment. Good news is that it looks like some of the splendid dishes Liam came up with are still present in some way on the menu – including 12-hour smoked brisket, smoked ox cheek with house pickles and the legendary sticky toffee pudding with salted caramel sauce. And finally, another ex Smokehouse chef is Martin Powdrill who also went on to do great work at Cured at Brewdog. He and co-chef Ollie have confirmed they have now have a new venue for their restaurant. More news is promised soon but the restaurant will have a new name to reflect the new location. Good news that The Smokehouse is popping up again from the end of February at Braunstone Gate’s O Bar. Its previous sojoun last November provided hearty American barbecue food with the flair, innovation and quality you are never going to find in, well, Frankie and Benny’s. I reckon they will get a fair amount of repeat business – including me – and there’ll be plenty of new people wanting to give it a try. It reopens on 27 February. While I’m reflecting on good news – I reckon there’s a bit of a coffee renaissance going on in Leicester right now. St Martin’s Tea and Coffee is of course now a fully fledged coffee specialist, roasting their own and providing a good range of beans and serving options. We’ve also now got Bread and Honey – a basic but appealing coffee and sandwich stop on King Street serving excellent Monmouth Coffee – and newly opened in Silver Arcade is Deli Flavour. This classy deli (one of the 50 best in the country according to the Independent) has been well established in Stoneygate for a good few years but now also has a lovely unit on the second floor serving excellent coffee in comfy surroundings with great sandwiches and extensive deli selection including Hambleton bread. Add these to established places such as Café Roma and we’re starting to get a real choice of quality coffee beyond the chains. Anyone like to give further recommendations? Having already given quite a decent big-up to The Smokehouse pop-up at Leicester’s O Bar, I suppose I was a little nervous about it being a bit of a let down. Fortunately, turns out I needn’t have worried. Aside from the pretty basic and uncomfortable seating, five of us had a gorgeous lunch there on Sunday. I’m not going to give a blow-by-blow review – the venue is already getting plenty of positive coverage – but the long and the short of it is that here was very good, down-to-earth flavour-led food at fair prices. We enjoyed pulled pork, 12-hour brisket with house rub and barbecued chicken with smoked bacon rub – all of them really showing the benefit of the long and slow treatment. I really loved the sides too – smoked fennel and aubergine salad with sweet raisin puree was a complete revelation, fennel and jalapeno slaw was lip-tinglingly good while delicious barbecue baked beans seemed to have had a hearty slug of maple syrup to give a sweet edge. Opinions were a little divided over the salt baked potatoes, baked in a pastry crust, but I certainly felt they gained something from the treatment. Pick of the deserts was an absolutely stonking sticky toffee pudding with a salted caramel bourbon sauce. Definitely recommend finding space for that if it’s on when you go. The craft beers were great, you’re even offered tasting if you’re unfamiliar to what contemporary brewers are doing. I had the Camden pale ale, and it was a good match for the food on offer. Staff are lovely too and generally you want to thank everyone involved for giving it a go. I’m sorry there’s no pictures, but anyway this isn’t pretty food to be admired on the plate – it’s food to get stuck into and enjoy. You should try it while it’s here. I’m certainly going back. It’s great news that Leicester’s West End is about to get a specialist barbecue restaurant – even if it’s only going to last a month. The Pop-Up Smokehouse will be operate from 7 November to 8 December and will bring flavours of the American mid-west and south to the O Bar on Braunstone Gate. It’s an initiative of the Orange Tree group who want to try and bring back a bit of innovation to this part of Leicester’s West End which has suffered a spate of closures. It’s also lost a fair bit of its special character since De Montfort University used its muscle to get the Bowstring Bridge removed. The owners sat down with chef Liam Watson, who spent three years with the group at the Lansdowne on London Road, and thought about how to bring a bit buzz back. I caught up with Liam on Saturday when he was giving away a few free samples at Orange Tree on High Street. “Most of recent investment has gone to the Cultural Quarter in the East of the city,’ he explains “That’s great, but it’s no secret that the West End needs a bit of a push. We had a think about what we could do and tried to come up with something outside the box – something enjoyable that would make a big impact on customers but didn’t involve too much cost.” The answer was a new Green Mountain grill and a pop-up restaurant in a bar that has not previously served food. The inspiration came from a trip to Pitt Cue, the hugely popular Soho smokehouse. “It blew me away,” enthuses Liam. ” And fortunately they’ve now brought out a book with recipes…”. So what can we expect? Classic, dry-rubbed, slow-cooked, St Louis cut of pork ribs given 12 hours with a hickory, maple and oak smoke. Chicken, of course. 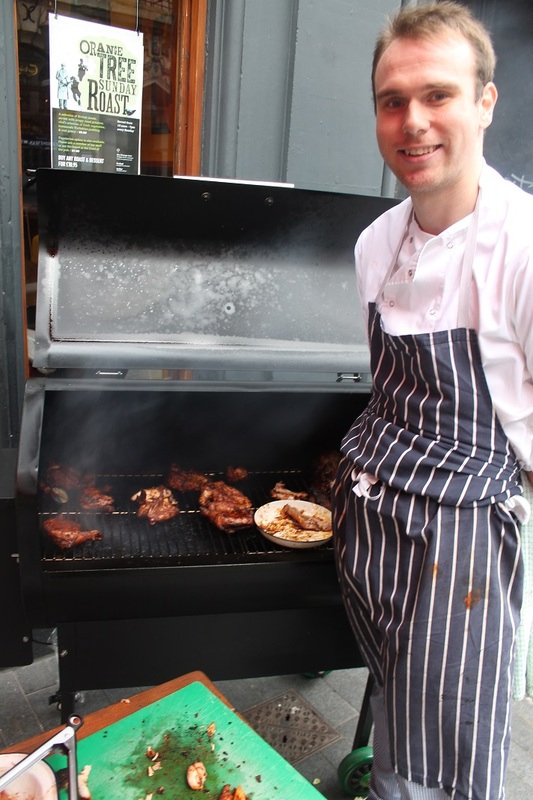 But the hugely enthusiastic Liam also wants to be more adventurous, so look out for braised oxtail with smoked oysters in chocolate porter (all the meals are going to be matched with craft ales), beef ribs, pork cheeks and scorched mackerel. For this dish the fish just gets a sousing and then subtle smoke from a blowtorch to crisp up the skin. There’ll be vegetarian options too – “we found butternut squash takes the smoke really well,” says Liam. After December they’ll have a think about how it all went. Maybe they’ll have to put it down to experience. Maybe they’ll be tempted to try it again and keep popping up at festivals and events. Or just maybe they’ll be encouraged to think about something more permanent. Whatever, judging by the beautifully tender and tasty samples I tried, and the impressive way they seem to have thought this through, the Smokehouse would appear to be well worth a trip (you can book on 0116 255 8223). Last week the Nottingham Evening Post was boasting about how their city had totally trumped Leicester and Derby in Observer Food Awards. Initiatives like this – as well as smarter openings such the White Peacock – are exactly what we need to maintain and improve the city’s food culture. Driving back to Leicester from Lincolnshire I was wondering what to do about lunch, when it hit me. I’d been meaning for many months to get out to the Kings Arms at Wing and here was a perfect opportunity for a quiet midweek lunch. This characterful Rutland Inn has a great reputation for its game and for its nose to tail, everything home-produced or locally made ethos. With an onsite smoke house this applies to all the smoked produce and charcuterie as well as breads, stocks, chutneys etc. With the rain begining to pour outside I fancied something comforting and picked the leg of hare from a specials board. It was lovely – cooked sous-vide it was as tender as a leg could be and oozed gamey richness. 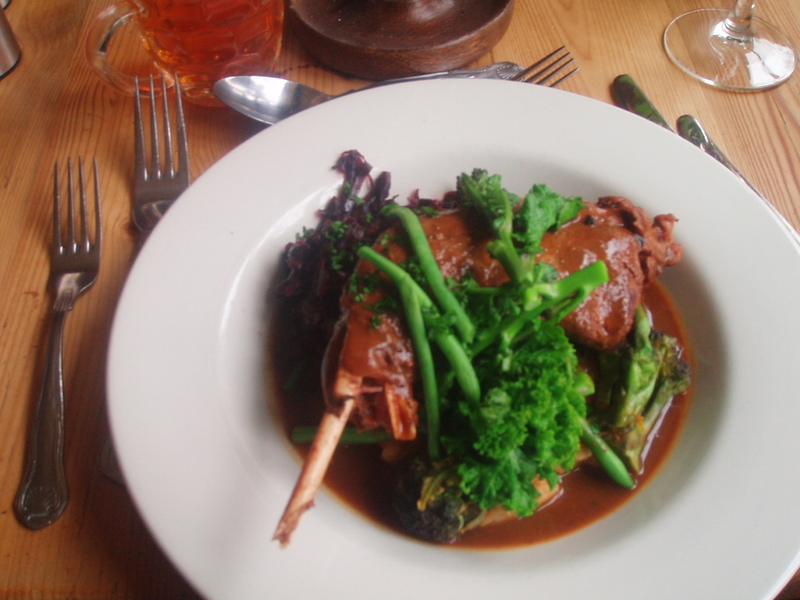 It was not even the star of the plate though, with the bang on season purple spouting broccoli being simply outstanding. There’s been a lot of hype about this vegetable this year and this stuff almost seemed to justify it – lightly cooked, slightly sweet with an almost meaty texture, it was the antithesis of “eat yer greens they’re good for you”. Beautiful red cabbage, curly kale, green beans, smooth mash and proper gravy completed a lovely dish for just over a tenner. The landlady sweet talked me into a desert but I was glad she did. A pastry chef just back from Denmark was on fine form she assured me and I tried her suggestion of the raspberry tart. Made from preternaturally thin, crisp pastry it contained sweet fresh raspberries swirled together with coulis and creme patisserie. 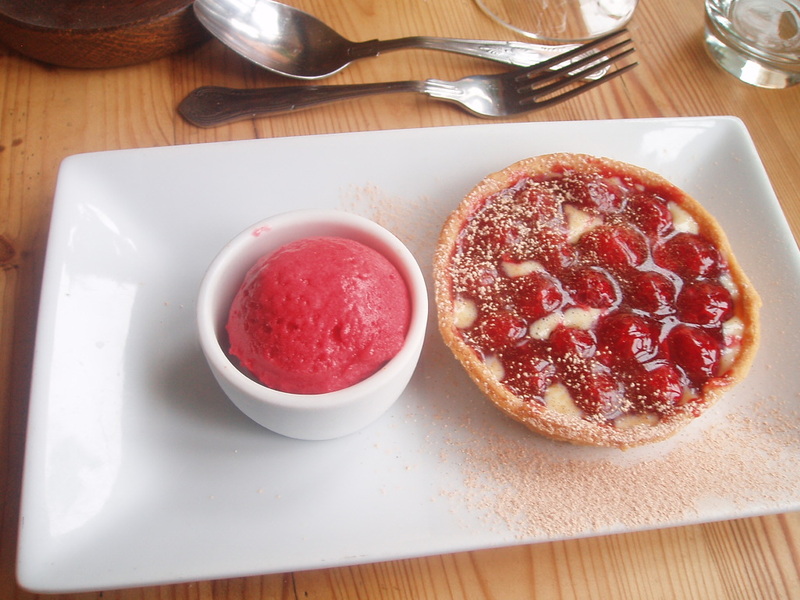 Accompanying raspberry sorbet lacked a bit of punch but it didn’t really matter, the tart was a compelling enough item. So off I sped off feeling very well fed and with a pack of home-smoked pancetta to boot. Result. Keen to go back and try the full menu now. How can you not warm to place offering a starter of “Duo of Pilton Mangalitsa – set brawn, crispy cheek, smoked tomato & celeriac remoulade”?